It’s the most wonderful time of the year, and the MCH Choir is ready to sing about it. 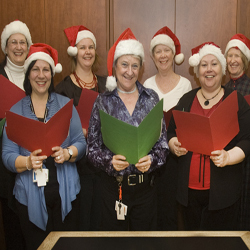 On Thursday, December 23rd, this dedicated group of vocalists will be singing Christmas songs to patients and staff throughout the hospital. From lullabies to upbeat classics, they have an exciting list of tunes to showcase their talents. If their jazzy take on Jingle Bells doesn’t fill you with the holiday spirit, we don’t know what will!